Interested in becoming a correctional officer? JobTestPrep is here to help you pass your Correction Officer Exam. 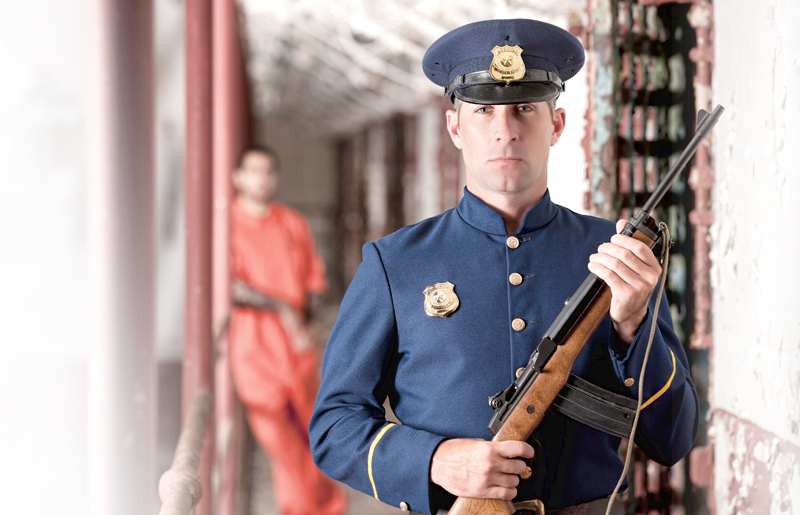 Our correctional officer study guide offers questions with answers and full explanations to give you the skills and thoroughness necessary to pass the correctional officer test. Ready for success? Start preparing with JobTestPrep's resources today. Becoming a correctional officer is a highly competitive process. Getting to know everything about the recruitment process will help you succeed. One of the first steps to this process is to take a written exam. The correctional officer test can be either a computer or written examination. It may also be a video test. You will view a video and will be asked how you would respond to the scenario in the video. There may also be multiple-choice questions based on the video. In general, there are 80 – 100 multiple choice questions with a time limit of 2.5 – 3 hours. Below is a list of popular Correction Officer Exams found in various states that are provided by assessment companies. The Corrections Officer Exam is a civil service exam. The Department of Civil Service administers the exam for those interested in becoming a correctional officer. The correctional officer exam is the same as the detention officer test. This is the most crucial phase of the correctional officer hiring procedure, as the results of the Corrections Officer Test directly determine whether or not you will proceed in the employment process. Alexander Graham Bell once said that “Before anything else, preparation is the key to success.” We can prepare you for popular corrections exams that your state requires you to take with our practice packs. Our packs were custom-made to make it feel like you are taking the actual exam. We prepare you by providing test content and structure so that you can become familiar with the exam. Our Correction Officer Premium Practice Pack gives you the tools to succeed on the correction officer test. The Correctional Officer Test Preparation Package will prepare you for all of the following positions as well: Federal Correctional Officer, Juvenile Corrections officer and Youth Correctional Officer. Egrometrics and other trademarks are the property of their respective trademark holders. None of the trademark holders are affiliated with JobTestPrep or this website.